Easter Cortex is fairly straightforward game, originally written for the Retro Remakes 2007 Easter Mini competition. 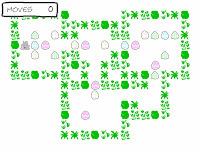 The objective is to clear the level of eggs. Eggs are removed by pushing them together in matching groups of three or more. The cursor keys move the rabbit. You can only push eggs from behind, so be careful of pushing them into corners or against walls. Also try not to leave yourself with fewer than three of any design. Press the escape key to return to the level selection screen if you get stuck.